Groupon, to the shock of onlookers, recently turned down a $6 billion buyout offer from Google. Yes, that's billion with a "B." They apparently have a lot of faith in the growth of their business model despite the threat from competitors like LivingSocial. In an article from CustomerThink.com, Bryan Pearson talks about the future of Groupon from a loyalty standpoint. He makes the point that Groupon is doing great now but needs to plan how to retain that loyalty and enthusiasm down the road. One of these suggestions is offering free Groupons to loyal users or rewarding them loyalty points for frequently buying deals. Definitely a few solid point of suggestions from Pearson. Why couldn't we take that idea a step further. With gaming elements becoming more prevalent in loyalty and rewards, what if you were to add a game layer to Groupon loyalty?. Part of the appeal to Groupon for a business offering a deal is increased brand exposure. Sure they are giving steep discounts but I assume the goal is to have more people walking through the door that may not have otherwise. In return, that "preview" of their business may result in more return customers. SCVNGR's game model is built mainly on a progression dynamic, meaning that one has to complete a series of tasks to achieve some ultimate goal. We talk more about that dynamic on this post. Let's say a Groupon buyer wants to earn a free Groupon. They could not only buy X number of deals to ultimately earn a free deal (like the Subway sticker card or punch card for a free hair cut) but could also ask for brand interaction in return. They could have a game set up on SCVNGR asking customers to "check-in" using SCNVGR to earn points, giving that particular business an online shout out. 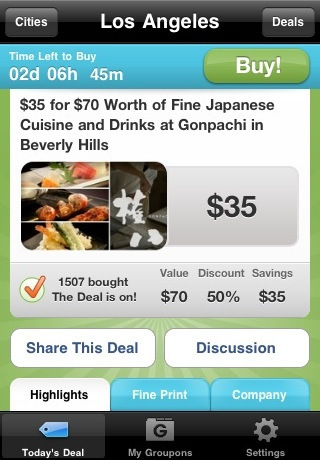 In addition, deal buyers could earn more points by taking a picture of their Groupon deal, mentioning what they're ordering (if the deal is at a restaurant), taking a pic of that venue etc. Ultimately, the "game" on SCVNGR would be to earn enough points to land a free Groupon deal. By participating in the above tasks (checking in, snapping photos etc) deal buyers could earn points. Using the progression bar provided by SCVNGR, these consumers would be able to see how many tasks or deals they would have to redeem and participate in to earn a free deal. This game function would not only improve brand awareness for businesses offering deals but increase engagement and loyalty for Groupon. Obvoiously, this concept could be taken in many different directions and would require more marketing specificity and could involve other services. What do you all think? Could LBS help improve Groupon loyalty? How else could Groupon create loyalty?